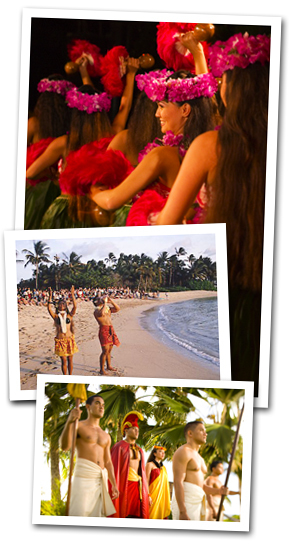 The Hawaiian Luau you've dreamed of exists here! Enjoy an unforgettable evening of fun activities, delicious island cuisine and spectacular entertainment at Hawaii's Best Luau! A tropical Mai Tai greeting and traditional Hawaiian music set the festive mood of the evening. 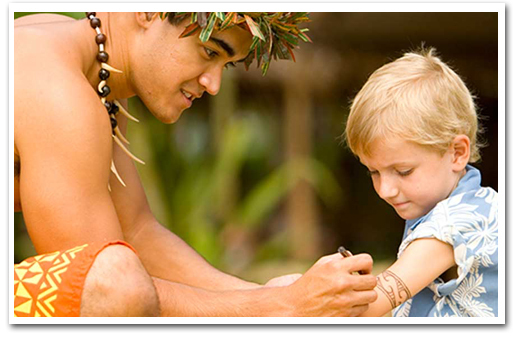 Casually stroll through the Hawaiian Village and learn the Arts & Crafts of the islands or test your skills at our Hawaiian Games. 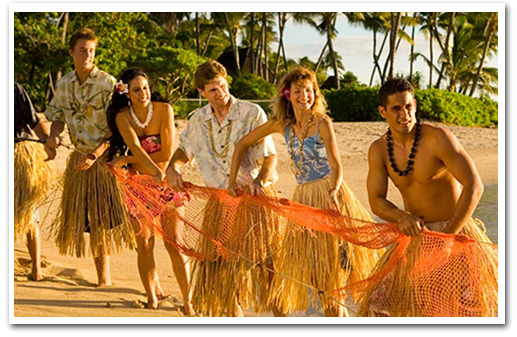 After the delightful Shower of Flowers, participate in the Hukilau on the Beach and learn the net fishing techniques of old Hawaii. Witness the time-honored techniques of underground oven cooking at the Imu Ceremony. The evening continues with a feast in the company of friends, old and new. Bring your appetite to fully enjoy Paradise Cove’s extensive menu which tastefully blends the best of traditional Hawaiian dishes, local favorites and continental cuisine. 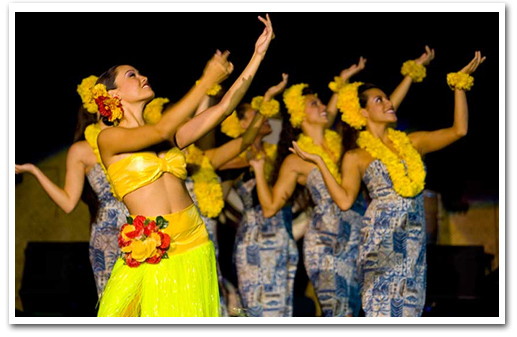 With the most spectacular Hawaiian sunset as a backdrop, our award-winning performers will entertain and amaze you with an unforgettable display of songs and dances of Hawaii and polynesian cultural at the incomparable Paradise Cove Extravaganza. Children 3 and under are admitted free providing they do not take a dinner plate or a seat on the bus or at the Luau. 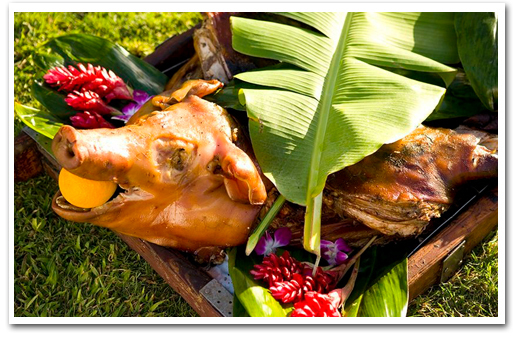 Blends the best of traditional Hawaiian dishes, local favorites and continental cuisine. Menu is set, but may vary based on availability or seasonality of dishes. Guests 21 years of age and older must present a picture ID to order or consume alcohol. From Waikiki,take H-1 West towards Waianae and continue on Farrington Highway (93). Take the Ko Olina exit to Aliinui Drive and continue past the guard shack. The Paradise Cove parking lot will be on your right. 3:45 P.M. — 4:15 P.M.
7:00 P.M. — 8:00 P.M.
8:00 P.M. — 8:45 P.M.
Activities may vary depending on weather condition. Packages and pricing subject to change without prior notice or obligation. All events and times are weather permitting and are subject to change without notice. No refund for cancellations made within 48 hours of Lu'au. Non-attendance will result in being charged in full. No refund or credit for unredeemed, unwanted or unused package inclusions, amenities or activities, including drink tickets. Flat shoes and light sweaters are recommended for safety and comfort. Menu is set, but may vary based on availability or seasonality of dishes. Guests 21 years of age and older must present a picture ID to order or consume alcohol. Special requirements (i.e. wheelchair lift) need to be requested 72 hours in advance. Vegetarian meal option is available when purchasing the deluxe Luau Buffet Package only and needs to be requested 72 hours in advance. 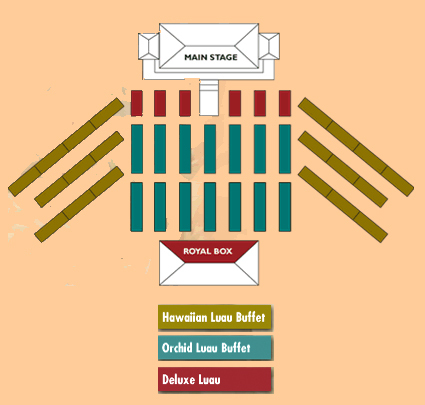 A rebooking fee will be charged for re-scheduled reservations received after 12 noon on the day of the luau. *Waikiki.com shall not be liable to any individual utilizing these tour/activity programs for delays, injury, loss, accident or damage to persons or property beyond its control. Natural phenomena are random and out of the control of the tour provider. Prices, features and/or menu are subject to change without notice.